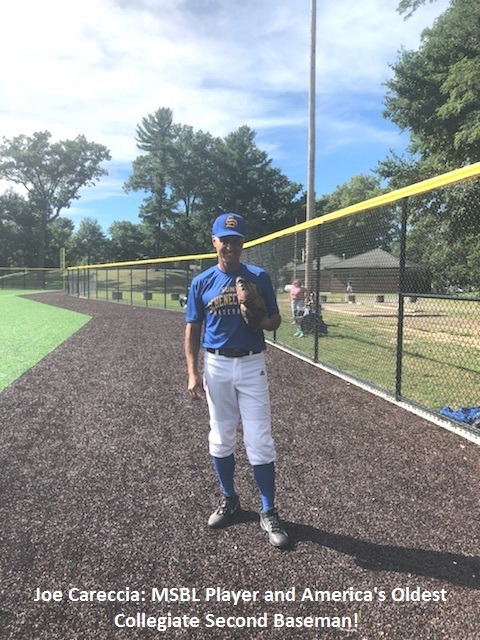 Joe Careccia is a 54 year old second baseman and center fielder who is a resident of Albany, New York and plays in the Capital District MSBL in the 33+ and 45+ divisions. Joe is also a part of Mike Lacomb’s Mustangs traveling team that plays in regional and national tournaments. In fact, he will be competing in this year’s MSBL World Series in the 50+ division for the DC Mustangs. OK, what’s the big deal? Thousands of MSBL players can claim this scenario. Now it gets interesting. This can only be explained by Joe himself. “I’m an NCAA College umpire besides being a player. Because I still play I worry about hurting my arm throwing back to the pitcher when I’m the home plate ump. So when I’m familiar with a team and their coach I sometimes ask the coach if I can warm up with a player. Well, two years ago I did this with the Schenectady Community College team. The team got a kick out of it and the coach said in a kidding fashion that it’s too bad I couldn’t play for them. So I looked at him and asked if he was serious. He was, though half kidding, so I looked into my eligibility. What he didn’t know is that I’ve always wanted to play college ball but was never focused enough to even give it a shot. I checked with the athletic director and he told me I had two semesters of eligibility so I decided to try. I hired a fitness coach, a batting coach and several pitching coaches and for two years I worked out and got as good as I’ve ever been. I went to a tryout and made the team. Yes, I’m seriously on the team. It’s so funny because I’m facing college pitching now in the fall and in a couple of weeks I’ll be facing 50 and over pitchers in Arizona at the MSBL World Series. I contacted Guinness Book of World Records because I’m pretty sure I’m the oldest college player ever. I’m still waiting to hear back from them. I’ll keep you posted!